Walking down the street in my hometown back in the late-1960’s; an old acquaintance stopped me to say hello; “So, what are you doing with yourself?” My response, “I’m a cook in a restaurant.” Uncomfortable pause: “Oh, so what are you planning on doing in the future?” Being a cook was certainly not an acclaimed career. This was the perception that many people had, not too long ago. Fast forward to 2014, that same question posed would bring a much different response. Today, being a restaurant cook or chef draws enthusiasm, interest and even envy on the part of those who are outside of our industry club. The media has certainly emphasized the glamor and drama of working in a kitchen. Good, bad or indifferent, this new image has, at the very least, raised us from second-class citizens to a position of stature. What is most interesting to me is the level of misconception that exists among those who are looking in from the outside. Many of these “wanna be” cooks, and certainly all who have taken the leap and enrolled in culinary school, could recite the names of the prominent chefs of old as well as those who make the headlines today. Careme, Escoffier, Point, Bocuse, Waters, Shire, Keller, Trotter, Adria, Garces, Batali, Bastianich, Puck, Dufresne, Achatz, and Chang are all chefs who grabbed the limelight and have earned tremendous acclaim from patrons and critics alike. This, of course, is well deserved, but what about the cooks? If you Google the title, “chef” you will find hundreds of resources to choose from. The same search for “cook” is barely noticeable. Why is this? 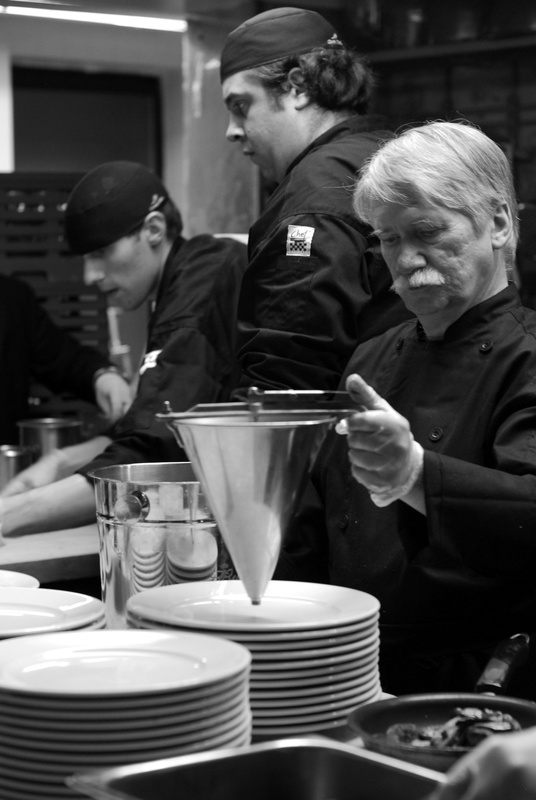 Cooks are the initial influencers in a career chefs’ life. They are the individuals who turned on that light bulb for many who wound up saying, “This is what I need to do with my life.” Through their career, it is the cook who allows the chef, to be the chef. Consider this statistic: there are 85 Ritz Carlton hotels worldwide, as an example. This means there are 85 Executive Chefs working for Ritz. The average hotel will likely employ at least 20 cooks to get the job done (oftentimes many more than 20). This means that Ritz will likely employ 2,000 or more cooks. The World Association of Cooks Societies (WACS) states that there are 10 million cooks and chefs around the globe. Using the Ritz model (precise data is not available), one could assume there are about 400,000 chefs worldwide and an astonishing 9.6 million cooks. Who do you think is getting the job done? Why is it that few are praising the work of this significant population of dedicated craftspeople? A job description for a cook will most often include – product identification, accomplished knife skills, a full understanding of foundational cooking methods, efficiency, speed, professionalism, dedication to sanitation and food safety, quick reaction time, the ability to problem solve in the moment, physical strength, stamina, the ability to work well with others, a sophisticated palate, and the passion for serving others. This is a full array of skills and aptitudes that would leave many outside of the business, scratching their heads. Great cooks are able to make a mountain of work facing them, look like child’s play. Yet, where is the recognition for these champions of the restaurant experience? Seasoned cooks have calloused hands, burns and scars from stitches that stretched from fingertips to elbows and hands that are polished from years of abuse. So much abuse that their fingerprints would be difficult to identify by the FBI. These battle scars are the impetus for war stories of cooks who can pull 400-degree pans from the oven with their bare hands and retrieve a misplaced item from the deep fryer without the use of a basket (yes, some are really able to do this). Some cooks have aspirations of working up to that chef position someday, while many are perfectly content to be the “line dog”. This is their calling; it is what they are good at. Millie was the first cook I ever worked with. At the age of 15, I was not terribly excited about planning my future, but a summer job helping Millie as a short-order cook, was a life-changing experience. Millie taught me how important it was to be organized and efficient. She also demonstrated that cooking was an important job with social responsibilities. She would talk, listen and laugh with all of the steady patrons who came for her western omelets, grilled Danish and French toast. What I discovered that summer was they also came because Millie made them feel special. Patsie (I later determined that this was short for Patissier) was the pastry cook (they didn’t have a pastry chef) at the Statler Hilton Hotel. He was Italian, short, full of confidence, efficient and the best pastry person I have ever witnessed. As an apprentice with this hotel I had the opportunity to work in all departments. My time with Patsie gave me an opportunity to experience making ice cream, genoise, pastry cream, meringue, puff dough, Danish and Pate au Choux. I still remember peeling and poaching fresh peaches for his peach ice cream, preparing Baked Alaska for functions in excess of 1,000 and the classic Peche Melba for those special parties. Frenchie (never knew his name either) was the butcher. He came from Southern France and had been working at the Statler for 17 years. He only spoke in French (no one understood him) because he refused to learn English. Watching him with a knife was an incredible experience. I was his gofer, but still had the opportunity to marvel at his skill. Lloyd was from Jamaica. He was the closest person to the position of sous chef (without having the title) at the hotel. Most of the time he bounced back and forth from special small parties to working the line. I learned how to work the line in a dinner house from Lloyd. This was the cook who showed me how to cook a steak to different degrees of doneness, what it meant to sauté, the difference between deep frying and pan frying, how to open clams for Casino, the right way to roast a 109 rib, and how to make a roux. Each of these skills served me throughout my career. What I know about cooking is as much a result of my time with Lloyd as with anyone else. Don was the banquet cook (again, they didn’t believe in titles back then). Believe it or not, Don had 10 kids at home. Aside from this challenge he was a very big man, probably 400 pounds, and drank more than anyone I have ever known (two six packs of beer and a bottle of vodka every day – AT WORK). Don worked six days a week, typically 12-15 hours a day and showed me the importance of work ethic in the restaurant business. His motto was always, “Whatever it takes.” Eight banquets today from 20, up to 1,200: not a problem for Don. This was the guy who could pull a hot roasting pan from the oven with his bare hands (might have been the alcohol that helped). Haddie was the cook at an operation I managed for Buffalo State College. We typically would serve 600-800 lunches every day. She handled this work without much complaint, was always on time, never missed a day, and produced excellent food that was reminiscent of home. Haddie taught me how important it was to care for the food and care for the customer. She also taught me how to respect those who worked for me and was first to point out how incompetent I was as a manager. Thanks for teaching me humility Haddie. John was a student of mine who later returned to work for me as an instructor. I threw him into a baking class at one point when there was an immediate opening. John was not a baker at the time, but he committed himself to learn. Over the years I marveled at his passion for the craft as he grew to become one of the best artisan bread bakers that I know. John taught me how important it was to stay focused and become great at something. Who do you remember? What cooks have influenced you? You cannot become a successful chef without spending sufficient time as a cook and you must be dedicated to becoming good at it. You cannot remain successful as a chef without understanding and recognizing how important cooks are to the operation of a kitchen. Remember, we are all cooks first. I have just started my career in the kitchen & always told people I wanted to be a cook & not a chef. After reading this article I have become more inspired and am more focused to work hard and achieve my goal. Thank you very much for this article. Respect. Jamie, malky, maczek, dougie, James, nico.